The financial world as we know it may be ending, the bear may be prowling the corridors, the greedy getting their comeuppance, and lights going out in Canary Wharf, but Investment Bankers still know how to party and last week I scraped a ticket to a client-focused, flagship philanthropy event in a major London gallery: drinks, canapes, and a private tour of the collection. What's not to like? The word was: 300 had been invited - bankers, dealers, rainmakers, sales staff and clients both corporate and hedge fund. 43 turned up - product controllers, IT, risk management, paralegals and admin as well four others with jobs indescribable. It seems like no one actually wants to party any more. And who can blame us? On the tour we admired this painting, and how much the artist had packed into it, cryptic references piled onto obscure allusions all competing for attention in a crowded space (imagine! 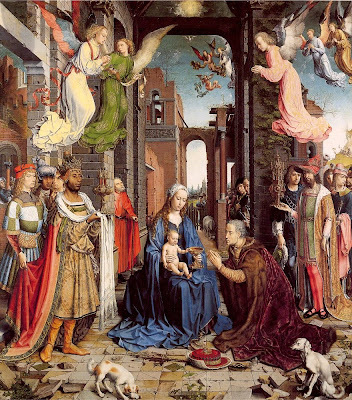 ), for instance the major elements of the nativity story are all there: the stable, the three kings, the annunciation to the shepherds, the holy spirit descending from the star. One of the themes of the painting (our guide explained) is that the old give way to the new: there's Joseph (that's him in the doorway, dressed in orange) portrayed as an old man, while Mary looks no more than sixteen. Look at the bottom where there is an old dog and a young dog. Look at the buildings: the old, classical and ruined giving way in the distance to a church, modern, fine and young. The older employees looked ruefully at one another and shifted their feet. The three kings themselves are represented in the conventional way: one black, one white and one Eastern. Their races are unspecified in the bible, it's a convention - explained our artist - that developed in the Renaissance. Three kings, one each of the major racial groups of the time. It was a device, said our guide, to stress diversity and universality. I looked over my shoulder at our own corporate display board - a group of serious, but smiling employees gathered around a boardroom table, and then back at the painting.